True vibrato like the old days. To the left of the purple Diamand Vibrato in the upper tray. In this second photo of Wayne Sermon's other pedal board, source from the Rig Rundown with Imagine Dragons, the Vibrato sits just above the Superego. "I came across Malekko, they make these little mini ones. They're just tiny. I really like the sound of them, and they're also really affordable." In this video Andy Othling shows his pedalboard including the Malekko Vibrato pedal. When Stu was asked which pedals he used in a Reddit AMA he replied, "yo... carbon copy, maleko vibrato, DD3, torns peaker, cry baby." "...little Malekko pedals, I use the phaser and vibrato ones live a lot." 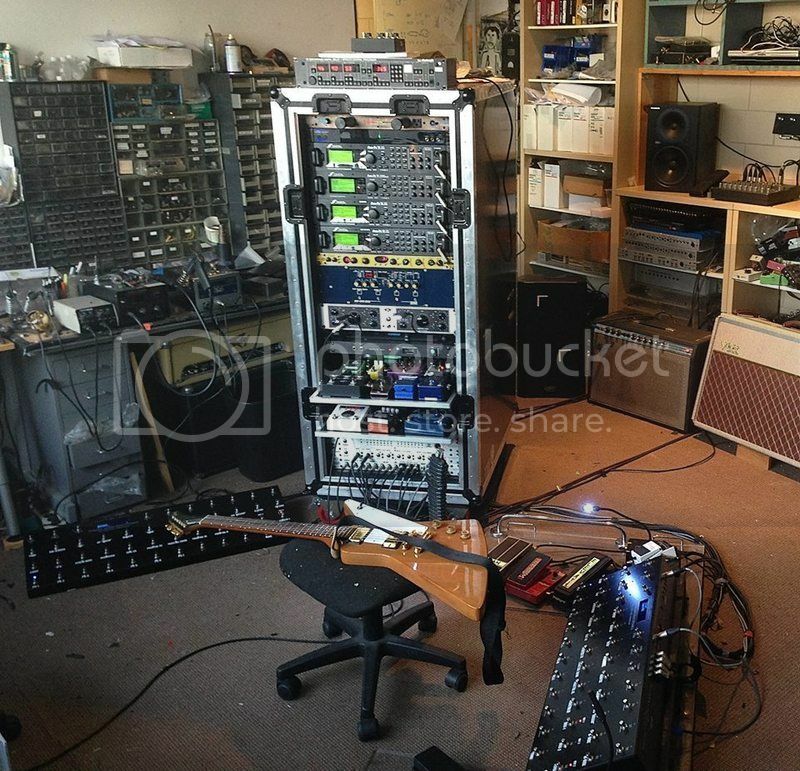 At Stu Mackenzie pedal board, a malekko vibrato omicron can be seen. Featuring cool new graphics, VIBRATO now runs on 18v and sounds better than ever. For those knowledgeable on the subject, the long since discontinued MN3007 IC has a much nicer sound than its little brother, the MN3207. The MN3007 are coveted by pedal builders and the D.I.Y. community for their superior sound quality. Often counterfeited, these ICs are tricky to purchase. Early in the year 2009 Malekko acquired a giant lot of actual obsolete MN3007 BBD ICs and went to work. The result is a superior lush analog true pitch (no dry) vibrato pedal in an unprecedented tiny enclosure¦all at an affordable price. Small and simple to use, this true bypass pedal has two control pots: speed and depth. It can't get easier than that! This pedal is capable of subtle shimmer to awesome deep pitch bending and everywhere in between. Although this vibrato pedal will operate with a 9VDC regulated neg tip power supply (not included), it will sound fuller, richer, and have more headroom with a 18VDC regulated neg tip power supply (not included). Current draw is 50mA. Enclosure size approx. 3.6"x 1.5"x 1.2". No reviews or videos yet for Malekko Heavy Industry Omicron Series Vibrato Guitar Effects Pedal. With an Equipboard account you can rate this item, add it to your collection, submit a review to discuss what you like and dislike about it, and associate Malekko Heavy Industry Omicron Series Vibrato Guitar Effects Pedal to artists that use it. Create an account!